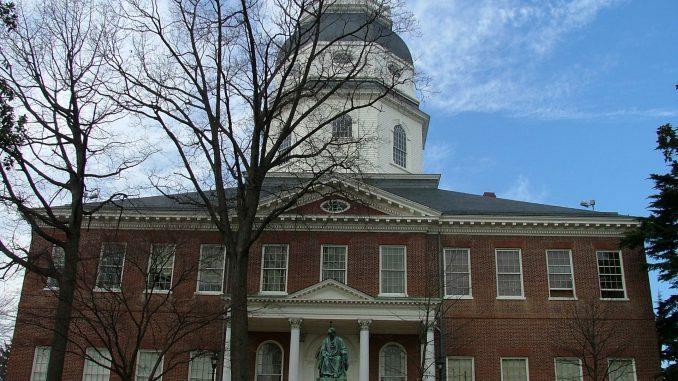 The Maryland State House at Annapolis is the oldest state capitol in the United States in continuous legislative use. 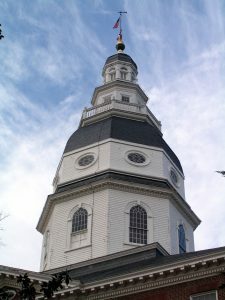 Completed in 1797, the wooden topped structure houses the Maryland General Assembly, the office of the Governor, and the office of the Lieutenant Governor. Designated as a National Historic Landmark in 1960, the current state house is actually the third to be built on the site. The wood dome at the top of the state house has the distinction of being the largest wooden dome in the United States to be built without the use of nails. Because of the American Revolutionary War, the building of the State House took longer than originally expected. The construction began in 1772 and took 25 years to complete. The two-story Georgian style structure was designed by Joseph Horatio Anderson who was a prominent architect at the time. With a small portico jutting out from the center of the building and two large arched windows on either side of the entrance, the building is simultaneously awe inspiring and inviting. There is a cornice topped with a pediment and an ontagonal drum on top of which is the large dome. The dome is topped with another octagonal drum and a lightning rod designed by Benjamin Franklin. In 1818 a short brick wall was built around the State House to prevent the intrusion of cattle. The wall was replaced in 1836 with an iron fence opening the building up to the eye and giving it a statelier appearance.